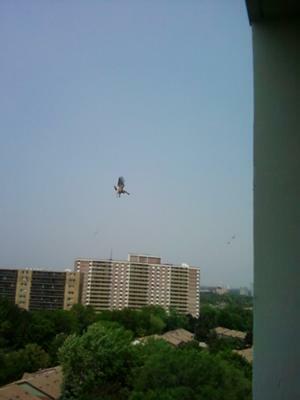 Well this is my 2nd submission about the many, many Hawks who make my neighbourhood home. 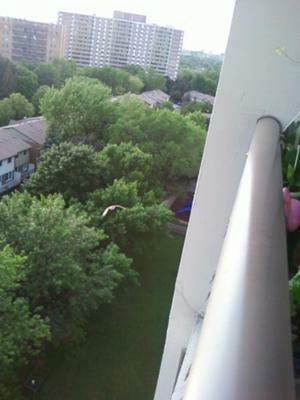 I have had several Hawks land on my balcony railing over the years, and somewhere here on this site a picture of a Red Tail on my balcony. 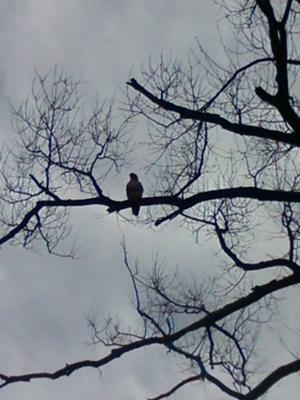 Anyway, today I have a pic of a young Coopers Hawk (I believe it is) who has been living in my area. I have seen him (or her, I believe it is a male due to smaller size.) I learned recently that in the raptor famale (Owls, Hawks, Eagles, Falcons and Ospreys) the female is always larger than the male .....w ho knew! 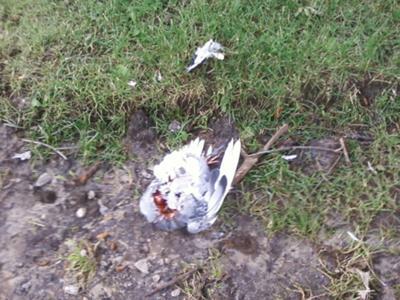 Here are pictures of the young Hawk sitting in his favorite tree, and one of his fresh kill (I believe he is still honing his hunting skills,) as this pigeon drop[ed right in front of my face practically! Wow - thanks for your report and for your great pictures!